This week's image is presumably from July of 1936. I know nothing of its provenance other than what can be observed. The photograph was in a group of three that appeared to be similarly styled, aged, and annotated (the handwriting on the back was the same). 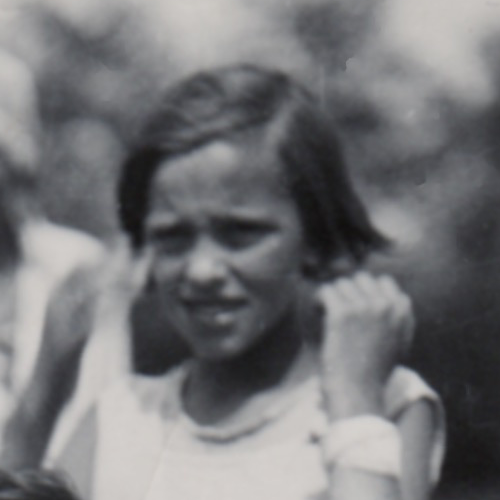 The image consists of a group of young children with what appears to be one adult woman in charge and two other adults blurred in the background. "A little group of children out at 'childrens Village' in Leningrad (St. Petersburg) July 1936"
Though I am not an expert in photographic paper, something about the actual picture seemed off to me. I wondered if this was a more modern print of and older image. The writing on the back also seemed modern, both in its script and its ink. The ink was clear, bold, and unfaded. "The city was renamed Petrograd in 1914, at the beginning of World War I, because it sounded less German, was then named Leningrad after the death of Vladimir Lenin in 1924, and again became St. Petersburg in 1991 when the Soviet Union collapsed. Confusingly, the surrounding region (oblast) is still known as Leningrad." Between 1924 and 1991 this city was referred to as Leningrad. I suppose it is possible that the notation on the back of the photo was simply referring to the name change before 1924. It seems more likely, however, that it is referring to the fact that the the name was changed back to St. Petersburg in 1991. That would put the writing at less than 25 years old. Next I wondered if this was a previously published image. I did a google reverse image search to see if the image in question had been published elsewhere on the internet. Nothing came up. It doesn't guarantee that it hasn't been published elsewhere, but it is evidence that supports it. MY HYPOTHESIS: This is an original amateur image taken in Leningrad in 1936. It may be a reprint or a copy of the original photo. And, the annotation on the back is less than 25 years old. One thing I know for certain: these children have stunningly soulful faces. Please click through the gallery of closeups below. Look into these children's eyes and imagine their stories. What was a "Children's Village" in 1936 Leningrad? Was this an orphanage? A school? How can we confirm if this is an original or reprint? What do you think, feel, and wonder when you look at those faces? How do the experiences of your ancestors' youths impact YOUR personality? What stories do you know about your grandparents childhoods? Where did these children end up? Are any of them alive today? Look at the closeup below of the girls holding hands. What words come to mind? Thank you! Check your inbox to confirm!